Why Imply “found” = “enlisted” When it Clearly Means “discovered” in a Coal Association’s Annual Report? The situation is as elemental as it gets: Ross Gelbspan wants the public to believe the fossil fuel industry conceived and implemented a plan to save its own skin, and to carry this out, they found scientists who would spout any skeptic notion they were paid to say. To hammer this home in a way ensuring no one questions it, he says this plan is declared just that way in a Western Fuels Association annual report. End of story. But there’s a critical unspoken stipulation here, that no one should read the actual report or see the context in which the specific word “found” appears. 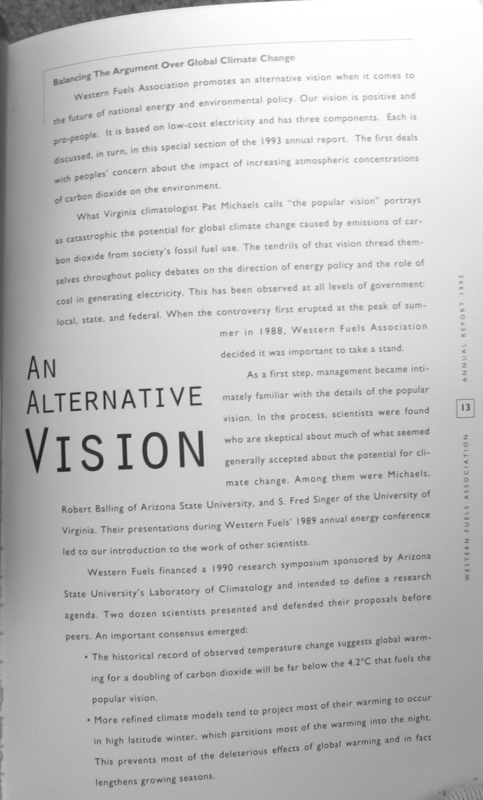 In the early 1990s, when climate scientists began to suspect that our burning of coal and oil was changing the earth’s climate, Western Fuels, then a $400 million coal cooperative, declared in its annual report that it was enlisting several scientists who were skeptical about climate change—Patrick Michaels, Robert Balling, and S. Fred Singer—as spokesmen. The coal industry paid these and a handful of other skeptics some $1 million over a three-year period and sent them around the country to speak to the press and the public. 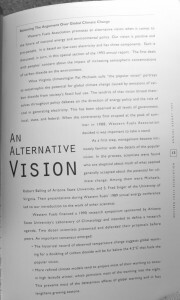 According to internal strategy papers I obtained at the time, the purpose of the campaign was “to reposition global warming as theory (not fact),” with an emphasis on targeting “older, less educated males,” and “younger, low-income women” in districts that received their electricity from coal, and who preferably had a representative on the House Energy and Commerce Committee. Accept what Gelbspan says without question, and you have all the reason in the world to worry that some kind of sinister campaign is on to recklessly downplay the global warming crisis. Take time to dig into this narrative, and you see crippling faults. The actual report says nothing about Fred Singer being a spokesman, and in relation to the ‘sent around the country‘ line, Dr Singer was never involved in that. Plus, the ‘sent around the country‘ line itself crumbles apart in short order, and the situation about Gelbspan ‘obtaining‘ the strategy papers is highly questionable. Scientists were not “enlisted” – found – to carry out an ill-advised directive of the fossil fuel industry, Western Fuels took a careful look into the issue and found scientists who introduced the organization to others having skepticism about the idea of man-caused global warming. There is no way of misinterpreting that. So the basic question is, among all the other I’ve pointed to here at GelbspanFiles, why would he go to such efforts to point the public in a direction that is not supported by the actual documents he quotes? And the larger question is, why do no others corroborate his accusation that skeptic scientists were paid to lie to the public by fossil fuel interests about the global warming issue? This entry was posted in Irreconcilable differences, Narrative derailment, Western Fuels Association and tagged attacking mainstream science, Mother Jones by Russell Cook. Bookmark the permalink.